My husband George has lived through several Duran Duran concerts during our marriage—one in 2005 at Vets Memorial, the other a few years later at the Schott. In both cases, he made a valiant attempt to get me backstage to meet the objects of my absolutely rabid adolescent ardor. George, who works in radio, culled favors from everywhere he could think of: other radio people, record reps, anyone. No dice. I know why he was unsuccessful. Every living female between the ages of 40 and 55 loves Duran Duran. Seriously, it’s a documented fact. Still, it was a failure that haunted him until he made good on his wish one weekend in Chicago at the House of Blues. Having a gimp for a wife didn’t hurt. Saddled with a walking boot from the foot surgery I’d had three weeks earlier, I approached the concert hall with crutches and a pin protruding from one toe. The folks at the Houe of Blues couldn’t have been nicer, especially when their elevator broke down and I had to take three flights of steps to get to the standing room only concert. That was a lot of fun. To make up for it, a security guard escorted George and me to a bar at the back of the room where a private party was happening. Nearby, we saw a line of people making their way up a back staircase. George knows how to sniff out a meet-and-greet, so he began to investigate. He felt sure that, atop those stairs, we’d find Duran Duran. I was hardly in any condition to be stealthy or to outrun security. George politely questioned several people as they made their way down the stairs. Some shunned him, but he persevered and determined that, yes, the line led to a backstage meeting. And I gleaned from conversations around me that some folks at the private party had paid $500 apiece for the honor of meeting the band. It may sound excessive to you, but not to me. Or at least the part of me that still remembers being 13 years old and willing to sell a kidney—perhaps even my own—to meet Duran Duran. Finally, George approached a woman who will forever be known as My New Best Friend. She saw my pitiful condition and lent George her pass to see the band. I hobbled up the stairs. No one stopped me. Indeed, people felt merciful over my trudging around crippled and offered me a chair. 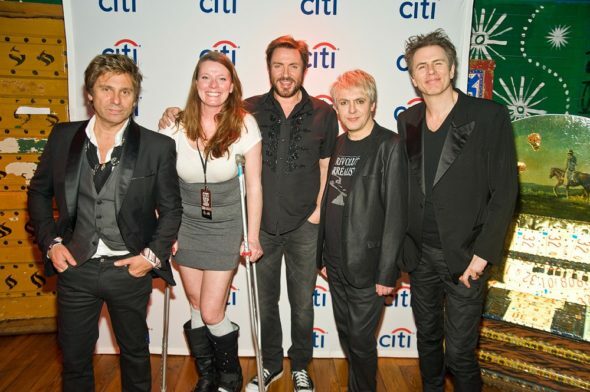 I could see Roger Taylor from where I sat in the hallway, injured foot tucked safely behind crutches. For those of you outside the precious D2 demographic, Roger is the drummer and second cutest bandmate. 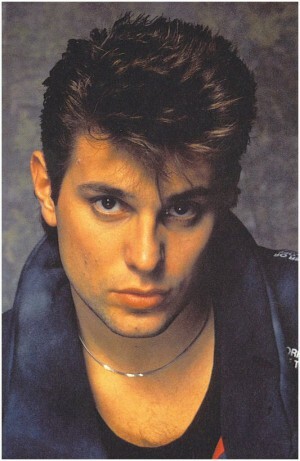 His spiky brunette locks and playful pout adorned my closet door. 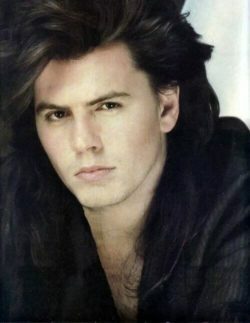 It hung just below my most beloved John Taylor (bass player, born Nigel John Taylor, 6/20/60 to Jean and Jack Taylor in the Birmingham, England suburb of Hollywood). “One more,” Roger near-groaned as he walked toward the door. Then he eyeballed the gimp in the hall and realized the special circumstances of which I was so gleefully taking advantage. “Oh, hon, what happened to you?” he asked me. My mouth, on the other hand, let out a string of sounds bearing no relation whatsoever to the English language. He winced in knowing embarrassment for me. I assume I’m not the first female wearing a Duran Duran tee shirt who’s been unable to respond properly to a polite query from Roger Taylor. Simon (singer) put his arm around me. Nick (keyboardist with heavy lipstick) hoped I’d heal soon. John steered clear, smiling from a safe distance. Now, if you’ll excuse me, I have to put my arm in a sling and research some Cory Hart concert dates.